Don’t let the economy keep you from enjoying your favorite entrees. 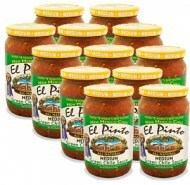 El Pinto dinner specials make enjoying authentic New Mexican food more affordable for you and your family. These smaller portions are great for a family on a budget or a smaller appetite. Served daily from 4pm-9pm. Two rolled chicken Enchiladas with your choice of red or green chile served with beans and rice. Three folded tacos with chicken, beef, or pork. Two flat enchiladas filled with our family recipe of chile con carne with beans and rice. Two stuffed sopapillas with chicken or beef and our choice of chile. 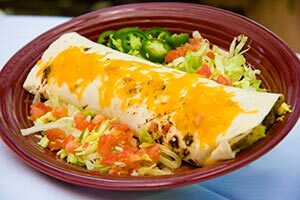 An 8-inch flour tortilla filled with your choice of chile, chicken or beef, beans and cheese. 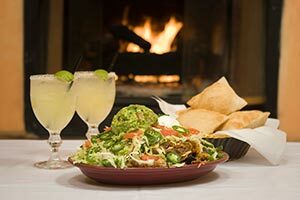 Enjoy red chile enchiladas, tamale pie, green chile enchiladas, folded taco bar, fresh fruit, tossed salad, green chile stew, posole, chile con carne, beans and rice, baked chicken with wild rice.